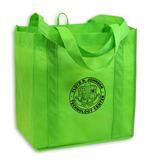 Recyclable, Non Woven, Polypropylene. 90 GSM. Imprint area: 7" x 7" Color Perfect 7" x 9"
Full Gussett. Covered Bottom Insert. Includes 1 color silkscreen imprint in 1 postition. 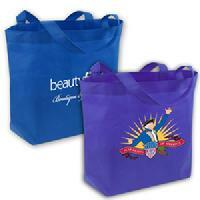 Imprint area: 7" x 7" Color Perfect 9" x 9"
Includes a Hard Plastic Bottom Insert. Size: 12" w x 13" h x full 8" gusset. 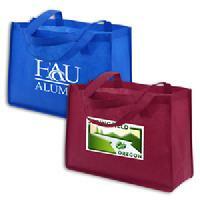 Imprint Area: 5" w x 7" h.
Tear Resistant - Water Repellent. Standard Imprint:: 6" wide x 6" high. Variable.